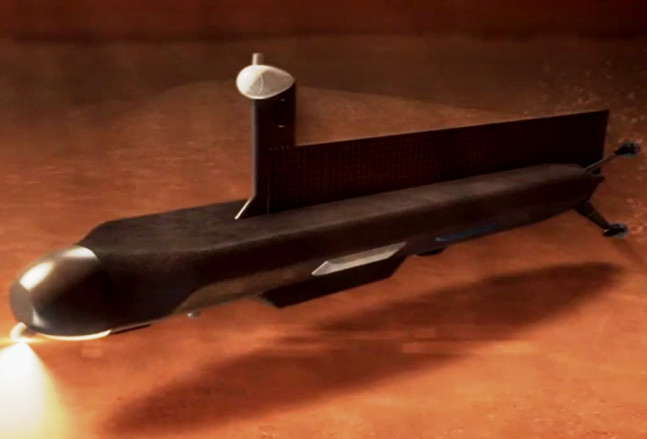 Earlier this month, NASA released an animated video depicting a proposed robotic submarine capable of exploring the liquid hydrocarbon seas of Saturn’s largest moon, Titan. The concept, which is a project of NASA Glenn’s COMPASS team, was presented at this year’s NASA Innovative Advanced Concepts (NIAC ) symposium. Titan, which was visited by the European Space Agency’s (ESA) Huygens probe in 2005, has a thick atmosphere and three large northern polar seas composed of liquid methane and ethane. The largest of the seas is Kraken Mare, which is about 600 miles (1000 kilometers) long but of unknown depth, and “its complex shoreline morphology and evaporite deposits mapped by Cassini hint at a rich chemistry and climate history,” according to the paper describing the design. The COMPASS team is developing a robot submersible to explore this unusual environment based on experience with terrestrial Autonomous Underwater Vehicles (AUVs) as well as spacecraft systems. The proposed vehicle would weigh approximately 1 ton and be powered by a radioisotope Stirling generator. If the mission is approved, the spacecraft would arrive at Titan in 2040 to make a 90-day, 1,240-mile (2,000-kilometer) journey around the perimeter and across the depths of Kraken Mare. The vessel would run a variety of tests and observe numerous characteristics of Kraken Mare, including tidal currents, meteorological phenomena, seafloor morphology, the sea state and the shoreline landscape. 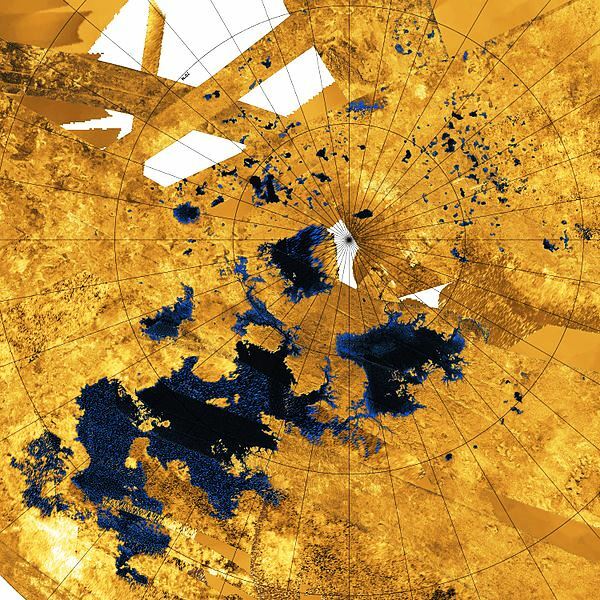 It would also acquire and analyze sediment from the seabed, and measure trace organic components of the sea, which, according to the writeup, “perhaps may exhibit prebiotic chemical evolution.” One aim would be to gain understanding of the historical cycles of filling and drying of Titan’s seas. The submarine would have a slender, low-drag hull with rear-mounted propulsors and a large dorsal phased array antenna. A surface camera would be mounted inside a streamlined cowl at the front of the antenna array. A sidescan sonar, seafloor camera and a seafloor sampling system would be mounted on the ventral side of the hull. The COMPASS team has also come up with a unique method for safely delivering the submarine to the surface of Titan. While the elongated submarine would not fit into a circular heat shield like those used for most planetary landers, it would fit snugly into the cargo bay of a Boeing X-37B spaceplane. The thick atmosphere of Titan would provide a relatively gentle cushion for hypersonic entry from space and the spaceplane could execute a soft ‘water’ landing, at which point the backshell covering the submarine would jettison and the spaceplane would sink, leaving the submarine floating and ready to be operational. Another possibility is to extract the submarine during low-level flight using a parachute. Conditions on Titan present a number of challenges, particularly for the submarine’s ballast tanks. A conventional ballast tank uses pressurized atmospheric gas to push liquid out of the tank, allowing the submarine to surface. The main component of Titan’s atmosphere is nitrogen, which would condense at depths greater than 984 feet (300 meters). Instead, the submarine would use a piston arrangement to isolate the sea liquid from a non-condensing pressurant, such as helium or neon. Design of the mission concept is still at a very early stage. More details may be revealed next month in a presentation at the Lunar and Planetary Science Conference (LPSC) in Woodland, Texas.